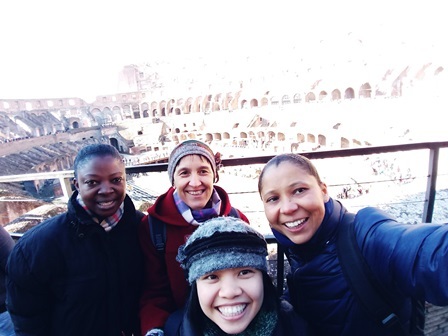 We, Hildete, Marceline, Nhung and Dominique are giving you some news of our session in Rome. We arrived last Sunday to participate in the training session “To invest our diversity in interculturality”, organized by the IUSP (International Union of Superiors General) from the 21st of January to the 1st of February. And what diversity there was! 180 sisters, from 46 congregations, representing 60 countries! The conferences, exchanges, work in groups succeeded one another at a high speed. The presentation of the symbols that each one had brought to express her culture was the first stage of that meeting. Each one, during the time of the opening prayer was welcomed in that way, 180 persons, one by one, expressed the meaning of the objected presented. A discovery of the diversity and communion with one another. Interculturality is not merely a sociological reality, a reality of our present-day world, but we discover the theological dimension of interculturalism as a conversion process to be really chosen, so as to pass from a kindly invitation of the other to a radical welcome that transforms our outlook and our heart. This long-lasting journey begins with the valuation of our differences and the work for going out to encounter on the basis of these. So, the common house becomes the house where each may feel at home, bringing and receiving according to her identity and her culture. We are struck by the dimension of the intercultural mission as a prophetic dialogue, with announcement and denouncement. The journey through the gospel, with the intercultural glasses, brings out again episodes like that of Jesus and the Canaanite woman who questions him and makes him move out of a vision centred on his people and his culture; in his encounter with the Samaritan woman Jesus came out of himself, he became a stranger and, in the difference, they found together a path of dialogue. As the days pass, we note that tools are brought to us in order to visualise clearly our way of living interculturalism as a congregation. We did not forget to experience the Roman specialities: a visit to the Coliseum, the Forum, the Trevi fountain, and the Spanish square… and then a good lunch of homemade pasta, of pizza, and a really good ice-cream to end the day. We pass through St Peter’s square every day and make a sign to Pope Francis who is in Panama! The welcome of the Fathers of the Assumption is very warm, simple and brotherly and we feel we are really in the family, and also with the Oblates who give a great service here in the welcome mission of that A.A. community.